An original, unique place overlooking the sea, nestling in the hills surrounding the Itria Valley. Overlooking the beaches of the Adriatic (10 minutes drive away), embraced by the magnificent countryside of Puglia, Vigne di Salmina is an oasis of relaxation for both mind and body. With 3 double bedrooms, each with bathroom, this accommodation can host 2+2+2 people form 400 euros per week for 2 people. Outdoor shower hidden among olive branches; barbecue; large 7-place heated tub; professional chef can be booked to prepare quality traditional cuisine; cleaner with weekly change of linen; more frequent house cleaning and linen change can be arranged. Vigne di Salamina can combine a peaceful relaxing holiday in the country and at the beach with trips to some of the most interesting places in the area - Bari, Castel del Monte, Trani, Alberobello, Lecce, and Otranto and to the delightful cities in the Itria Valley in the immediate vicinity like Cisternino to 8 km and Ostuni to 15 km. Amazing time at the trulli, beautiful tranquil location with spectacular view! What a find! There were 6 of us, 3 couples, so the trulli was perfect for us as there were 3 double rooms each with own bathroom and outside seating areas, well spaced for privacy. The place was spotlessly clean and comfortable and had everything we needed including a well equipped kitchen. Our host Nicla was amazing! She had prepared a welcome snack for us on arrival with delicious local fresh produce of meats, cheeses and wine. She also advised us of many interesting and beautiful places to visit in the Puglia area. We had hired a car and after a day of sight-seeing we returned to the trulli and had a barbecue followed by a dip in the hot tub in the evening sunshine. We had a wonderful time and would highly recommend. Dear Alan thank you very much for your nice words. It has been a real pleasure for me to the have had you at Vigne di Salmina. I have loved your family and I have been very happy that you enjoyed your holiday by us and appreciated the facilities here. Give my warmest regards to Norman, Audrey Selina, Hilary, Laura and to the fun Nigel. We were a group of 6 friends and we really appreciate to spend 4 days at Nicla's trulli. We enjoyed all of Nicla's good tips, especially for nice food. She is very kind. It was a lovely trip in a beautiful place, very well located near amazing villages of Puglia, with a very nice view. We are very happy that you enjoyed your short holiday at Vigne di Salamina and that you found useful our tips. It has been a pleasure to host your and your friends, we do our best for our guests so thank you again to have appreciated our efforts. Die Ferienewohnung liegt inmitten von Olivenhainen mit wunderschönen Aussichtsterassen mit Blick direkt auf das nahegelegene Meer. Die Besitzerin zelebrirete uns persönlich Spezialitäten aus der Region als Willkommensgruß. Wir emfanden dies als sehr nette und herzliche Geste. Konversation war in italienisch und englisch möglich. Die Beitzerin gab uns hilfreiche Insidertips für die Umgebung bezüglich Essen und Unternehmungen. Auch bei schlechtem Wetter sind die Wohnungen beheizbar. Diese Unterkunft ist sehr zu empfehlen. thank you very much for your review and your liking of my houses. Belle location avec 3 maisonnettes différentes comprenant chacune une salle de bain. 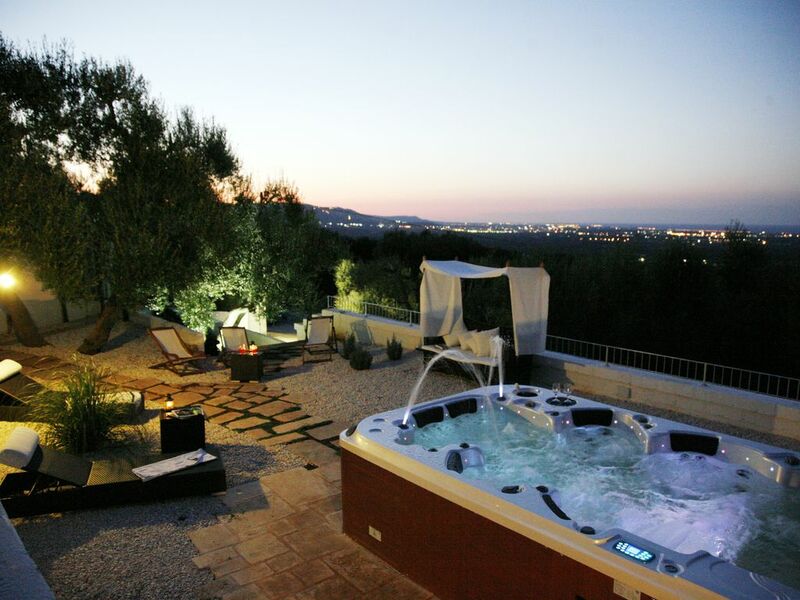 Jacuzzi extérieur avec vue. Une cuisine et 1 kitchenette...Parfait pour un séjour en famille ou entre amis dans les Pouilles. Accueil chaleureux des propriétaires! "location tres sympathique.les sanitaires sont neanmoins justes pour 4 personnes"
Il trullo in cui abbiamo alloggiato è molto carino, pulito e fornito di tutto il necessario. Bellissima la terrazza che si affaccia su una valle di olivi e da cui si vede il mare. I proprietari, che abitano accanto, sono simpatici, discreti e si sono dati molto da fare per darci consigli utili alla nostra vacanza.